Time management is incredibly important in any leadership role – not only is time valuable and does often actually equate to money, but it is also one of the few things which once wasted can never regained. No matter your wealth, power or position, you slow down, speed up or stop time. So learning good time management is an essential skill for an effective leader. One of the best ways to improve your time management is to analyse how you spend your time and trying to implement ways to stop wasting time on some tasks and save time in others. However, be careful of getting too bogged down in details – for example, you could spend so much time creating priority lists or time management spreadsheets, separating work into ‘priority piles’ or colour-coding tasks that you end up wasting more time in trying to manage it! All you could end up implementing time management techniques that are so complicated, you end up disheartened and return to your old bad habits. Procrastination – the biggest enemy! Implementing things without thinking it through and analysing the situation first for the most efficient solution. Planning and managing meetings carefully so that they have a time limit, a purpose and an expected outcome – and only involve the essential people. 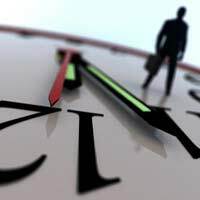 By following these simple steps – avoiding the time-wasting activities and trying to incorporate more time-saving activities in your routine - you can ensure that you practise effective time management in your leadership roles.